Perhaps it’s time to slow down and spend time with those you love? Beautiful coastlines, quaint fishing villages, lobster dinners and a wealth of culture and history are just a few of the delights of this relaxing driving vacation exploring the national parks of Nova Scotia and Prince Edward Island: Fundy National Park, Prince Edward Island NP, Cape Breton, and Kejimkujik National Park. We have also arranged for you to stay in historic inns and included a choice of daily adventures to suit most people (and we can always arrange others if you wish). We’ve re-imagined road trips, to keep the best parts and improve the not so great parts – like scrambling for a place to stay at the end of a long drive. Instead, we book you into the nicest inns, to suite your taste and budget. Our other road trip innovation is to include a selection of daily activity options, because we don’t want you to get to a place and spend half a day figuring out the best things to do. And if the options we have shown are not quite right just ask us and we’ll find something better. After all, personalizing your Canadian trip is what we do best. This coast is rich in history and culture – from Halifax’s Maritime and Immigration museums to a night of Celtic music in a local pub. But because our goal is to help you travel like a local, maybe the best cultural experience of all will be the chat you have with the woman in the coffee shop or the banter with a fisherman mending his nets…. Welcome to Halifax, the friendly Atlantic Ocean port city and capital of Nova Scotia. After your pre-arranged transfer drops you at your hotel, head out and explore what makes this city so great. A private driver will take you from Airport to your downtown hotel. Tonight we have taken the guess work out of where to dine and included a delicious dinner for you at one of our favourite restaurants in downtown Halifax. Head out today and discover what makes Halifax great! This beautiful ocean city is steeped in rich history and filled with tales of pirates and privateers dating back to before the War of 1812. Take a walk through this vibrant city, viewing historic buildings and modern high rises lining the streets. Discover historic Halifax on a privately guided tour. In a vehicle, visit the city's highlights including the Citadel, Public Gardens, Titanic Burial Site, Maritime Museum and Pier 21 immigration museum. Learn about the war of 1812 and the Halifax Explosion, as well as Nova Scotia's unique culture. Photograph one of Canada's icons with the beautiful dawn rising up over the North Atlantic - Peggy's Cove! At this time of day, you have the site all to yourself to explore with your guide - a local, professional photographer. Engage the senses with a food tour of Halifax! Visit historic landmarks, stroll along the waterfront, and taste the best local food in Halifax. Tour locations and food tastings will vary depending on day of the week you are exploring Halifax's culinary scene. Enjoy a leisurely drive taking in the picturesque seaside communities as you drive along Lighthouse Route to Lunenburg. Board the 48 foot wooden kech - the Eastern Star and set sail on this wind powered Classic Sailboat. Feel the wind and sea as you view Lunenburg Bay with its brightly painted buildings. 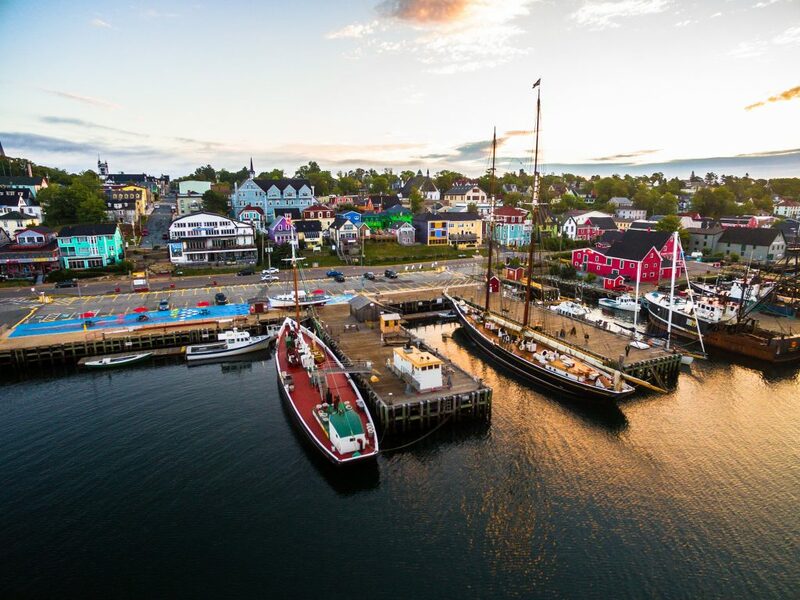 With spectacular sites around every corner in Old Town Lunenburg, your local guide will make the sites come alive with cultural tidbits like superstitions, folklore, and local facts, and they weave it all together with lots of unique personal stories and recommendations. Overnight at Bowcawen Inn. Overlooking Lunenburg harbor, this historic inn is located just three blocks from the historic waterfront. Within walking distance you'll find shops, restaurants, museums and entertainment. Enjoy a hot breakfast in the dining room each morning. After a day of exploring, relax on the Admiral's Deck, the perfect place to enjoy the harbor views with a glass of wine or cup of tea. Depart Lunenburg and drive east into spectacular Kejimkujik National Park and into Annapolis Royal which boasts a spectacular view of the Bay of Fundy. Join an unforgettable candlelight graveyard tour at Fort Anne in Annapolis Royal. Explore the oldest English graveyard in Canada with internationally acclaimed heritage interpreter who is 8th generation Acadian! While visiting Kejimkujik National Park, a self-guided canoe or kayak rental can be added in to your itinerary. Enjoy the serene calm of the lake waters as you paddle through the park. Overnight at the Queen Anne Inn. This grand Victorian Mansion is located along the Evangeline Trail in historic Annapolis Royal. The 1865 heritage property is set amongst stately Elm and Maple trees. The Inn offers posh, elegant rooms with antique furnishings, just a short walk from the Fort Anne National Historic Site. Included with your stay is a three-course breakfast served in the formal dining room each morning. Visit the Grand Pré Winery. Nova Scotia produces some of the best wines in Canada. Surprised? Convince yourself with a visit to the Grand Pré Winery - enjoy top quality local wines within a beautiful setting. Guided by a local and knowledgeable marine guide, encounter majestic marine life on a memorable boat tour around Brier Island in the Bay of Fundy. Join your guide on a walking tour today to experience Digby’s historic streetscapes and the culture of an active fishing community. Stroll back through the centuries as you discover Digby's dynamic history and rich cultural background. Join an experienced guide on a walking tour along the edge of the Bay of Fundy to observe the effects of a nine metre tidal range providing an exciting view into one of the world's most dynamic and diverse ecosystems. Spend a leisurely day travelling by car and ferry from Annapolis Royal, to the Bay of Fundy. Keep your eyes open for whales on your ferry ride and be sure to make time to stop in and visit the charming villages along your journey. Today you will be making the cross water journey from Digby, NS to St. John, NB. The ferry is approximately 3 hours long and crosses the Bay of Fundy. Overnight at St. Martins Country Inn. Overlooking the magnificent Bay of Fundy, the inn boasts stunning ocean views in the historic fishing village of St. Martins. Enjoy uniquely appointed rooms offering thoughtful amenities including a private bath. With complimentary Wi-Fi and a full breakfast, the property also features a gift shop, licensed restaurant and patio lounge. Fill your day with exploration as you travel along the Fundy Trail to the Hopewell Cape area. Take in a boat tour to get the best glimpse of this amazing natural wonder. Choose to add on guided 2 hour kayaking tour in the Bay of Fundy area today. The St. Martins sea caves are the biggest attraction in the area, best to be explored on the water. Choose to get up close to the beautiful coastline of the stunning Bay of Fundy on a 2 hour scenic boat tour. Enjoy views of the towering cliffs, enchanted caves and mossy caves and if your lucky, visits from some curious seals and porpoises. Overnight at Innisfree Bed and Breakfast. The B&B is a beautifully restored 160-year-old farmhouse nestled on 10 acres with wonderful gardens and forested trails. Hopewell Rocks Park is within walking distance, or just a few minutes away by car. Enjoy the inn's cozy features, including front verandah and living room. Included in your stay is a full breakfast served in a dining room furnished with period antiques. Visit the Hopewell Rocks – also known as “Flowerpots” - which slowly disappear and reappear with the dramatic rise and fall of the Bay of Fundy tides. See the world’s highest tide and later, enjoy the juxtaposition of walking on the seafloor. Hopewell Rocks offers a unique natural experience of both high and low tides. In addition to the opportunity to walk on the ocean’s floor, they have two sandy beach areas at either end of the park and a number of well-marked walking trails. For those wanting a quiet, countryside experience, ask us to book your nights at charming St. Peter’s Bay, a 45-minute drive from Charlottetown. Overnight at The Great George Hotel. This hotel is a unique collection of heritage buildings all richly renovated with their own character and story. During your stay, enjoy an evening reception featuring complimentary wine and local craft beer from the, guided walking tour to talk about the property, and among other amenities you'll enjoy free WiFi, turndown service, and complimentary breakfast. Take the opportunity today to immerse yourself in the charm and history this beautiful island and its people have to offer. Join a knowledgeable guide and cycle along Prince Edward Island National Park’s beautiful North Shore on the new multi-use trail between North Rustico and Cavendish. The Harbour Passage Tour is a great introduction to sea kayaking on the ocean and the perfect way to experience the magnificent coastline of Prince Edward Island’s North Shore. Smell the salty air, feel the gentle breeze against your face, and enjoy the thrill of taking a lobster right out of a trap! Savour the experience of a traditional Prince Edward Island lobster supper while aboard the 45-foot fishing boat on this excursion. Today is yours at leisure to explore Prince Edward Island’s small towns and picturesque landscapes. You might also enjoy exploring the dunes of Greenwich in Prince Edward National Park, savouring “Rick’s Famous Fish ‘n Chips”, or simply exploring historic Charlottetown. Overnight in Charlottetown. Charlottetown is both the largest city on and the provincial capital of Prince Edward Island, and the county seat of Queens County. Named after Charlotte of Mecklenburg-Strelitz, queen consort of the United Kingdom, Charlottetown was first incorporated as a town in 1855 and designated as a city in 1885. It was most famously the site of the Charlottetown Conference in 1864, the first gathering of Canadian and Maritime statesmen to debate the proposed Maritime Union and the more persuasive British North American Union, now known as Canadian Confederation. From this, the city adopted as its motto "Cunabula Foederis," meaning the birthplace of Confederation. Drive the scenic road to the Wood Islands ferry, then cross to Pictou - the birthplace of New Scotland. Continue over to Cape Breton via the Canso Causeway. Your journey ends in the little town of Baddeck, set on the shores of the gorgeous Bras d’Or Lakes. Located in the heart of Cape Breton, Baddeck is considered the beginning and end of the Cabot Trail. The 75-minute ferry takes you from Wood Island to Pictou - the birthplace of New Scotland. Overnight at The Baddeck Heritage House. Built in the 1800s, this hotel features historic charm and comfortable rooms. The Alexander Graham Bell Museum, Visitor Centre, village boardwalk, cafes, restaurants, and entertainment are all within easy walking distance. Enjoy a cup of coffee or tea and a hearty breakfast in the morning. Relax on the two-tier deck with beautiful views of Greenwood Church and the Bras d’Or Lakes beyond. Enjoy a day out exploring the local charm of the Baddeck area and its people. Join a local Baddeck Ceilidh, experience Celtic musicians play their art, you can join in songs, enjoy stories, and even learn dance steps if you wish. Situated in the heart of Cape Breton Island, Baddeck is known as the beginning and end of the world-famous Cabot Trail. Stretching along the shores of the beautiful Bras d'Or Lakes, Baddeck is a bustling village that maintains its essence as a quaint community. The Alexander Graham Bell National Historic Site offers exhibitions and interactive demonstrations. Visitors can also enjoy fully narrated tours of the Baddeck shoreline or see puffins in their natural habitat. Foodies will enjoy fresh lobster and a steaming cup of seafood chowder. And Nova Scotia’s newest Microbrewery, Big Spruce Brewing, is an 800-litre, certified organic, on-farm facility. Uisge Ban Falls Provincial Park Trail is a beautiful and moderate hike, which passes through a hardwood forest comprised largely of maple, birch and beech woods; and leads to the 50-foot-high waterfall. The Falls Trail is approximately 3km (1.8 miles) in length and requires about one hour to complete. Your half day tour will have you exploring the rich costal waters of St. Ann's Bay with eagles and other birdlife soaring overhead. Mid-day you will stretch your legs and enjoy a healthy and delicious snack on a small beach with a picturesque waterfall. Get up close to the Atlantic Puffin on this one of a kind boat tour. Learn about their interesting behaviours as they take turns coddling their single egg and hunting for fish. Puffins aren't the only creatures you'll see at this wildlife hot spot! Today explore the famous Cabot Trail – one of the most spectacular drives in all of Canada. The trail winds around the rocky splendours of Cape Breton’s northern shore, ascending to the incredible plateaus of Cape Breton Highlands National Park. For the more adventurous – Cape Breton Highlands National Park has 26 hiking trails ranging from 20-minute short walks to challenging hikes through stunning mountain and coastal landscapes. Nova Scotia is filled with idyllic fishing villages, as well as Atlantic Canada's largest metropolitan area, Halifax. Cape Breton Island in particular is known for its amazing natural beauty and captivating historical and cultural roots. Documentation package, including helpful driving instructions and tips. Halifax Tasting Tour departs on Sundays, Mondays & Tuesdays. On other days of the week, an alternate tasting tour will be substituted. Annapolis Valley Whale watching tour is available between June 16 and September 11 departure dates. Kayak and zodiac boat tours departure times will vary throughout the season as they are based on the tidal schedule. Lobster Dinner and Cruise in PEI is available between June 23 and September 5 departure dates. Kayak tour on PEI is available between May 6 and Sep 21 departure dates. Puffin and Seabird Viewing tour is available between May 30 and August 10 departure dates. Acadian Cultural Experience is available from the June 22 to August 21 departure dates. Tour is not available on Wednesday or Thursday departure days. All outdoor tours and boating tours may be subject to delays and cancellations due to unpredictable weather conditions. Lunenburg Nature Tour: Tour runs from mid June to mid September due to weather restrictions. Whale Watching Tour: Tour operates from end of June to end of September as this is the optimal time for whale viewing. Lobster Boil Cruise: Lobster tours don't begin offering tours until the beginning of July until the end of August as they are dependent on the lobster conditions and ideal weather. Car rental exclusions: GPS, LDW deductible of up to $500 depending on car type, Personal Accident Insurance (PAI), Personal Effects Coverage (PEC), fee for drivers under the age of 25, fuel and refueling fees. Our Canadian experience was awesome. Among our favorites were Kejimkujik canoeing, whale watching, Hopewell Rocks and Puffin Boat Tours. Our favorite bed and breakfast was Innisfree. The Great George hotel was the best ever. Outstanding experiences and outstanding accommodations. Our itinerary was wonderful and it gave us a chance to see every aspect of the Maritime provinces. We enjoyed a variety of foods by visiting local restaurants and trying local favorites. We had a wonderful trip in a lovely part of Canada. The itinerary was relaxing and allowed us to experience many areas, yet still left flexibility to personal exploration. The pace of the trip was excellent. We enjoyed the different attractions and planned trips, as well as the “surprises” such as the included meals. The highlight was our trip extension to Quirpon Island in Newfoundland, even though the weather was a bit tricky. The staff at Fresh Tracks were very helpful and quick to respond to inquiries – even though we booked everything from Australia. Great trip! Enjoyed our trip to the various locations. Lunenberg was simply amazing. The Geal, sailing and whale watching tours were very interesting. All arrangements worked out seamlessly and hassle free. The limo ride from the train station to our hotel was a very nice touch and big surprise. Breakfast at the Queen Ann Inn was fantastic. Accommodation selection in Halifax and Baddeck was fabulous.